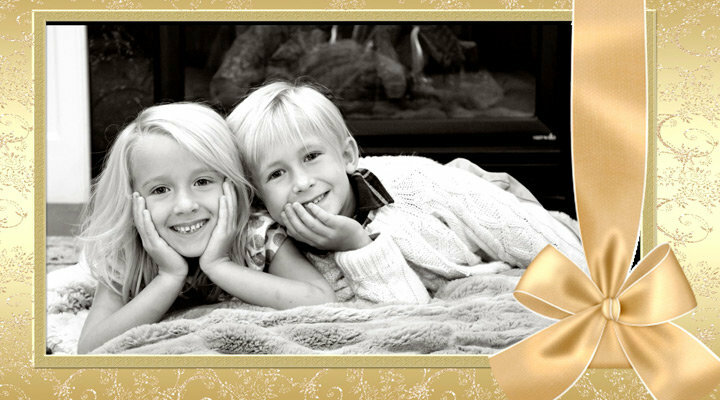 Tips for Better Holiday Photos  Watch the video to learn 10 simple tips for making better holiday photos of your kids this year. The first thing you’ll want to do is think about the light in the location you’re taking the pictures. If you’re taking photos indoors, is there window light streaming into the room or do you have to use lamps or other light fixtures. This may determine where in the room that you place your subjects. When photographing more than one person, coordinate their clothing. You want your subject’s clothing to compliment not clash with each other or the background if possible. If there isn’t enough light in the room, add a Speedlight onto the hot-shoe of the camera. It's the quickest and easiest way to add more light to your photograph. For a softer look to the lighting, bounce the light off of the ceiling. To do this, tilt the flash head upwards. When taking a vertical photograph, you’ll want to swivel the flash and tilt it so it is still bouncing off of the surface of the ceiling. Remember, if you’re taking color photographs to make sure that the ceiling is white. If the ceiling color is another color, the bounced light will pick up that color and introduce it into your photograph. Watch the background to make sure no distracting elements are getting into the photograph. You want to make sure that there’s nothing “growing out of your subject’s heads”. You also want to make sure that the background compliments your subjects. If you need to move something, go right ahead and do so. Try posing your subject how you want them to be within the photograph. You can do this by clearly explaining how you'd like them to sit or stand, or by showing them yourself. If you don’t want your subjects to feel posed, simply place them where you want them in the photograph and as you take photos, talk them through making slight adjustments to get a more natural look. Kids on the floor, get down with them or shoot from high above with them looking directly at the camera. Placing them on a chair or ottoman, change your level as well. Have fun and connect with your subjects by talking with them throughout the photo session. Make silly faces or sounds to make children giggle. If you’re adventurous and add a pet into the photograph, you’ll have to keep its attention as well so get ready to whistle or call him by name to get him to look at the camera with ears perked up. Most likely you’re going to be taking photographs for a short time, maybe 10 or 20 minutes or even longer and you need to keep the attention of your subjects throughout. Connecting with them so they enjoy themselves will make it easier for you to continue taking photographs.